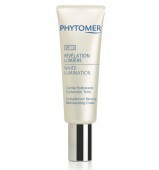 To reveal the radiance of the complexion and diminish dark spots, PHYTOMER has developed WHITE LUMINATION Brightening Radiance Treatment. This very complete treatment offers skin cleansing and chemical exfoliation in order to encourage a “new skin” effect. This is followed by a face massage carried out with the new Perfecting Massage Cream, an advanced professional product formulated to combine brightening action, dark spot correction and action on wrinkles. The application of the new Luminous Complexion Mask, Plasticizing with Vitamin C delivers a final burst of radiance for a glowing face. Results : reduced intensity and diminished size of dark spots. Skin is more luminous and more transparent with an immediate burst of radiance. * Satisfaction test conducted on 15 women who received a single treatment. A powerful exfoliating combination of marine AHA and fruit acid to brighten the complexion, tighten enlarged pores and reduce dark spots, perfect for a new skin effect. An ultra-light serum that visibly promotes a radiant complexion and reduces the appearance of dark spots to regain an even complexion that seems to burst from within. A pure white second skin mask that combines the brightening power of Vitamin C and purifying properties of argile for a fresh and radiant complexion. An immediate burst of radiance for a complexion glowing with beauty with total satisfaction in terms of skin radiance, the reduction of dark spots and the brightening of the complexion.